“The new regulations apply to every driver on the road. We will not be flexible and bend the law according to the size of the vehicle,” he said. He said the demerit point system would be implemented from April after the necessary amendments were effected to the Act. On January 9 this year, the three wheeler safety regulations were gazetted, but it was revised six months later following objections. According to the regulations, which were revised after discussions with the three-wheeler associations, the speed limit is 40kmph, the maximum number of adult passengers is three, if children are to travel two adults can accompany them as passengers, it is mandatory to instal a speedometer and a taxi meter and the minimum distance between the driver’s seat and the passenger’s seat should be 21.5cm. The NCRS statistics from January 1 to November 30 this year show 913 motorcyclists, 169 pillion riders, 263 push cyclists, 840 pedestrians, 222 drivers died in road accidents. 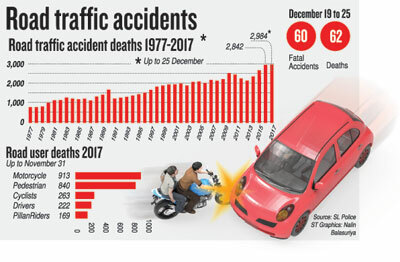 According to Traffic Police Headquarters statistics from January 1 to December 25, some 2,984 people died in 2,822 road accidents. During the festive season — from December 19 to 25 – around 62 people died in 60 road accidents. 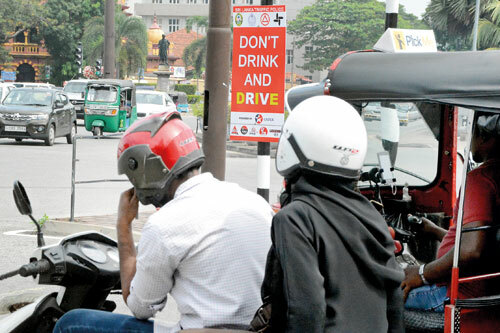 Police Media Spokesman Ruwan Gunasekara told the Sunday Times that the state of the driver, the vehicle, the infrastructure, the pedestrian behaviour and law enforcement authorities have to check to ensure road safety. “If one of these inter-related factors fails, accidents will occur,” he said. According to him, road deaths can be reduced by 60 percent if pedestrians and drivers are more careful without being negligent when using the road. Superintendent Gunasekara pointed out that various instruction classes and lectures are being conducted to educate the public regarding the gravity of accidents. “We are trying our best to reduce the fatalities caused by accidents. Statistics show that at least eight people die in road accidents every day in Sri Lanka. Our task is to bring the number down,” he said.